India is the land of flowing rivers, mountains, and diverse habitats. It is blessed with several diverse flora and fauna. The region’s rich and distinct wildlife is preserved in numerous national parks and wildlife sanctuaries across the country. To select the Top wildlife destinations in India is a mammoth task and it depends on what your interest is. India is home to several large mammals including the Bengal Tiger, Asian Elephant, Asiatic Lion, Leopard, Sloth Bear and Indian Rhinoceros and ungulates such as the rare Wild Asian Water buffalo, Nilgai, Gaur and several species of deer and antelope. For wildlife lovers and photographers, India is a blessing. We as photographers have selected some great places for large animals especially the Bengal Tiger. Wildlife Photo Tours have carefully selected some of the top wildlife destinations in India and have created a list of tours for incredible wildlife experience and photography. We offer private guided tours to these destinations for nature lovers & photographers from around the world to experience the same. See some of the photographs taken on our tours in our Gallery. Bandhavgarh National Park is India’s Premier parks. Bandhavgarh is best known for its Royal Bengal Tigers. Bandhavgarh is spread at Vindhya hills in Madhya Pradesh. It is relatively a small park and consists of a core area of 105 sq km and a buffer area of approximately 400 sq km of topography vary between steep ridges, undulating forest, and open meadows. The density of the Tiger population at Bandhavgarh is the highest known in India. If Tigers is your species of interest then Bandhavgarh is one of the best parks to visit. Join our Bandhavgarh Tiger Photography Tour. Ranthambore Tiger Reserve. Ranthambore National Park is a huge wildlife park near the town of Sawai Madhopur in Rajasthan, India. It was once a royal hunting ground. It is home to tigers, leopards and marsh crocodiles. Its scenery is a fabulous blend of wildlife and ancient relics. Its ruins include the impressive 10th-century Ranthambore Fort and other Moghul styled structures and mosques. There are a few lakes in the park where the Tigers have made their home. If you are fascinated by the thought of a tiger roaming in the ancient ruins now embraced by the jungle then Ranthambore will surely impress you. Join our Ranthambore Tiger Photography Tour. Tadoba Andhari Tiger Reserve (TATR) is the pristine and unique eco-system situated in Maharashtra, India. In recent times due to its healthy population of tigers and their regular sightings, Tadoba has become a favorite with those who wish to see and photograph the majestic Bengal tiger. Often referred to as “The Jewel of Vidharba”, in the north-eastern part of Maharashtra. Located in the heart of a reserved forest, it is an infinite treasure trove of innumerable species of trees and plants – and wildlife that includes tigers, panthers, sloth bears, hyenas, jackals, wild dogs, bison (Gaur), barking deer, nilgai, sambar, and cheetal. In fact, the Tadoba National Park and Andhari Wildlife Sanctuary together form the Tadoba-Andhari Tiger Reserve. It has been popular with local nature lovers & photographers, It is relatively new to mainstream tourism found in parks like Bandhavgarh. Corbett National Park is a forested wildlife sanctuary in Uttarakhand State of India. It is one of India’s most picturesque and pristine parks. Corbett has the honor of being India’s oldest and most prestigious National Park. Rich in flora and fauna, it’s known for its Bengal tigers. It is also the park where Project Tiger was first launched in 1973. Animals, including tigers, leopards, and wild elephants roam along with hundreds of species of birds. It is among the few tiger reserves in India that allow overnight stays in the core of the National Park. Its also home to the Gharial a fish-eating crocodile. There are several Forest rest houses inside the park most popular are Dhikala, Bijrani etc. The lush sal and bamboo forests, grassy meadows and ravines of Kanha provided inspiration to Rudyard Kipling for his famous novel “Jungle Book”. The Park’s landmark achievement is the preservation of the rare hardground Swamp Deer (Barasingha), saving it from near extinction. Kanha offers a variety of animals including the Bengal Tiger, Barasingha, Gaur (Indian Bison), Dholes(Indian wild dogs), Leopard etc. 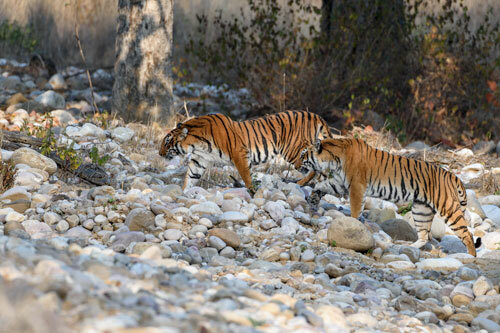 Aside from its diverse wildlife and bird population, the frequent sightings of Tigers roaming in the wild at Kanha Wildlife Sanctuary remain the most popular attraction. The only lions outside Africa exist in the Sasan Gir Forest Reserve in India. Situated in the district of Junagadh, Gir is the last place where the Asiatic Lion breathes. Raised from the brink of extinction about 20 to somewhere around 300 today, this is a success story most people don’t realize (of course if not protected properly these figures could easily diminish). In the land of tiger, the Lions roar seems to have faded away from lime light. Apart from the Asiatic Lions gir also boast a good number of leopards and large population of Marsh crocodiles. Kaziranga National Park. Kaziranga National Park lies partly in Golaghat District and partly in Nagaon District of Assam. A World Heritage Site, the park hosts two-thirds of the world’s Great One-horned Rhinoceroses. Kaziranga boasts the highest density of tigers among protected areas in the world. The park is home to large breeding populations of elephants, wild water buffalo, and swamp deer. Kaziranga has a very healthy tiger population and recent studies have shown that there are 17 per 100sqkm, which is the highest density in India. However, due to the tall ‘elephant grass’ habitat and very shy nature of the Tigers makes photographing tigers extremely rare in Kaziranga. It is a park holding India’s big five i.e. the Bengal Tiger, Asiatic Elephant, Wild Asiatic Water Buffalo, One-horned Rhinoceros, Swamp Deer (baransingha) including very good bird population. Although it is famous for its big five but there are so many other animals and birds here making it the most diverse of India’s forest.